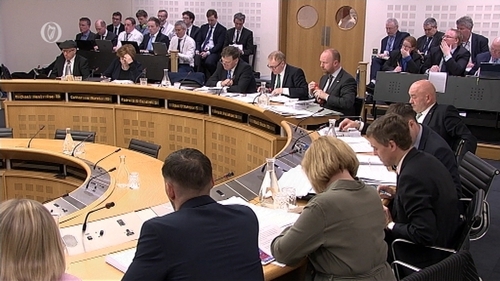 Minister for Sport Shane Ross and representatives from Sport Ireland are appearing before an Oireachtas committee this afternoon, to discuss financial and governance issues at the FAI. Last night, John Delaney, the FAI Executive Vice President, stepped aside pending the completion of an investigation into issues of concern to the board. The FAI declined to comment when asked whether Mr Delaney would continue to be paid while the investigation takes place. Two long-standing FAI board members, honorary secretary Michael Cody and treasurer Eddie Murray, resigned their positions voluntarily. It is nearly two weeks since the Chief Executive of Sport Ireland declined to express confidence in the board of the FAI. Today, John Treacy will update the Joint Oireachtas Committee on Tourism Transport and Sport on recent developments. The committee will hear that the FAI used all available funding from its various bank accounts in April 2017 when John Delaney loaned the association €100,000. The FAI’s failure to notify Sport Ireland of a material deterioration of its financial position at the time led to Sport Ireland’s suspension of funding. It is expected Mr Treacy will tell the committee that Sport Ireland will consider a full audit of the FAI, depending on the outcome of two other reviews, and that the board will review funding when governance and financial issues have been addressed. Taoiseach Leo Varadkar said last night that the Government could not continue to fund the FAI unless it is confident the organisation is being run properly. Meanwhile Fine Gael TD and Oireachtas Sports Committee chair, Fergus O'Dowd, has said Mr Delaney should "resign forthwith from everything", including his role in UEFA. Speaking on RTÉ's Today with Sean O'Rourke, Mr O'Dowd said the feeling from the committee is that the current FAI board should be replaced and there should be a forensic audit of the FAI. He said that an independent audit will give "comfort to everybody" and facts that people are entitled to know. Fellow committee member, Social Democrats co-leader Catherine Murphy, has said Mr Delaney's resignation is not enough to restore trust in the FAI. Speaking on RTÉ's Morning Ireland, Ms Murphy said: "No, it's not enough. I think most people would have greeted the statement with disbelief or maybe anger - that's how I felt myself. "It's far from what was expected. It's not enough to build trust in organisation again. I think there was an expectation that there would be far more in the way of announcements." She said the resignation raises more questions than answers - such who will carry out the independent investigation, and how long will it take. She also questioned why the FAI board signed off unanimously on a new role for Mr Delaney, and how the situation was allowed to reach the point it is at now. Ms Murphy said today's meeting will discuss the circumstances and conditions under which Sport Ireland will restore funding to the FAI. Minister Ross, she said, could insist on changes being implemented. Separately, Fine Gael TD and committee member Noel Rock said Mr Delaney's "stepping aside" from his role pending investigation is "simply not good enough". Mr Rock said "what we need is John Delaney to permanently step down and step away from the organisation, and what we need is a full corporate governance overhaul of the organisation".